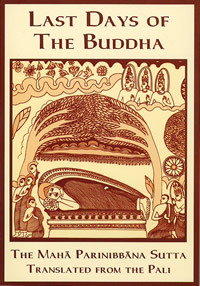 On the stirring final journey of the Buddha, covering three months, he instructs his disciples on the elements needed to keep the Dhamma strong and stresses the importance of putting his teaching into practice. This translation of the Maha Parinibbana Sutta was originally done by Sister Vajira, a nun from Germany, in 1964, and was revised and refined by Francis Story. Notes were added at the time of revision (1988) by Ven. Nyanaponika Thera. Finally this 2nd revised edition (1998) has been updated with stylistic changes that make the translation more modern. This is a small classic. This lucid translation of the story of the Buddha's final days and final instructions to his disciples should be in everyone's library.